HKS to Close US Operations, Save HKS USA! What the Hell? HKS to Close US Operations! We were shocked and dismayed to see this notice come across our desks yesterday afternoon. 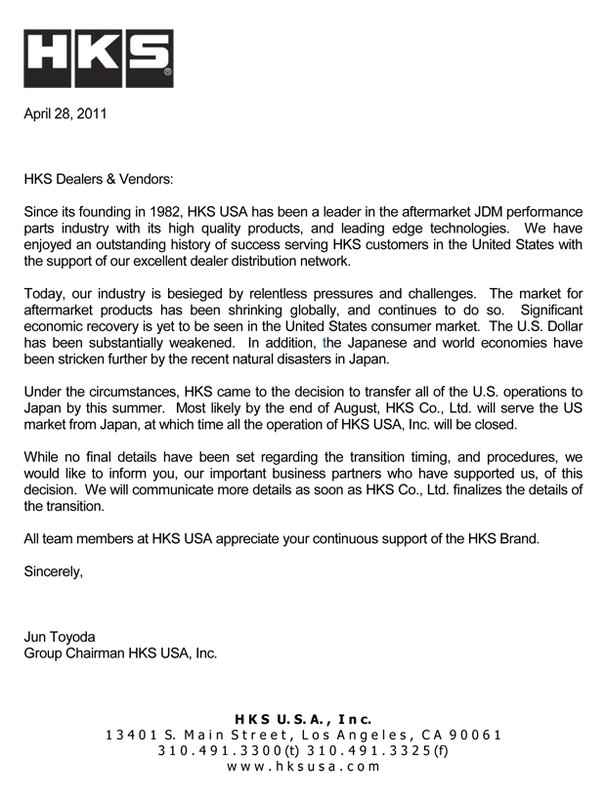 HKS the iconic Japanese manufacturer of some of the best engineered tuner parts on the market is ceasing US operations. HKS will start winding down operations and be done here sometime this summer, around August. This news came as a total shock. Many HKS employees have been our colleagues and close friends for years, even decades and of course we are concerned about their well being. MotoIQ is also a fan of and a strong supporter of companies like HKS that represent our true industry, the quality performance and innovation of the industry. Many factors are involved with this decision. HKS states the reasons in the official memo shown below as the slow economy in Japan and the US, a global lack of demand for performance parts, an unfavorable exchange rate between the yen and dollar and the devastating earthquake in Japan. At MotoIQ we feel that perhaps the most important reason has been left out. Probably HKS doesn’t want to point fingers and complain, it’s not Japanese style to do that so we will do it for them. HKS has been perhaps one of the biggest victims of Chinese companies ripping off their designs and selling reproduced cheap junk copies of their parts, some of it even boldly labeled as genuine HKS products. The staff of MotoIQ is calling on our readers to take a stand. Don’t support the makers of rip off parts. Beware of what you are buying, especially what you might buy on line on Ebay and the like. Don’t patronize the rip off companies and the fake JDM companies. HKS is not the only casualty. ARC, Apexi, JUN, RSR and Tanabe are all either defunct or greatly diminished in US presence because of the rip off artists. Many good US companies have been put out of business by them as well. Of all the leading Japanese tuning companies, only Greddy, ARK, RAYS, Tomei and Toda will be currently openly active and supportive of the US market. If you continue to patronize companies that rip off, soon you will have no parts other than janky copies of crap for your cars and no parts will be developed for newer cars. It’s hard for us to publicly name names of the rip off artists, last time we attempted to do this, we were threatened by a lawsuit. A prime example of a market that was eliminated by the Chinese was that of the Sentra SE-R. At one time it had a thriving aftermarket but the Chinese and Ebayers moved in and drove all the innovating companies either out of business or into other markets. Few quality parts are now available for the platform and the SE-R scene died. Few new parts have been developed for new Sentras and the only enthusiasts left are mostly people who build janky cars. All interest and innovation has moved on. The Chinese copycatter killed this platform dead in around three years. Now it’s happening on a larger scale. To stop this plague don’t buy fakes. Save your money and buy real parts. First of all, support MotoIQ’s advertisers and partners. MotoIQ has a no fakes policy. We will not work with producers of fakes nor accept advertising dollars from them. We have been approached by these charlatans many times and although it would have lined our pockets we turned them down. Legal action prevents us from naming crappy companies but nothing will prevent us from writing about good ones. Support companies like Rays, HKS, Greddy, Tomei, Toda, OS Giken, Kaaz, Tein and American companies like AMS, Full Race, Cobb, Turbonetics, Precision Turbo, and others that although perhaps they don’t advertise with us, you can bet we support them and they are fans of our site. Keep it real, buy real. HKS is not going out of business, their Japanese division will handle the US market but you can bet service will be slower, parts won’t be developed for the US market and the whole company may fail shortly. Although it is probably too late, lets start a grassroots effort to save HKS USA. Lets support them with our wallets. We will try to incorporate HKS products in our project cars and pay for them. If HKS wants it, we will give them free advertising until this crisis is passed. Please don’t comment about capitalism and competitiveness below. That’s not what this rant is about. Although we don’t moderate our comments much we will delete these kinds of posts. This is about our love for our cars and the love of building them correctly. This is about passion for our industry. This is about action. Let’s do something before it’s too late.